I honestly wasn’t sure if this little boy was having fun or just placating his mother. 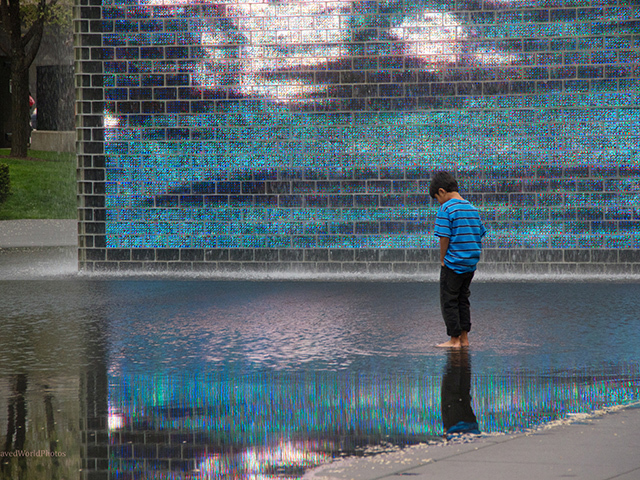 He very cautiously stepped into the water puddle left on the concrete by Crown Fountain, and only after a few minutes did he begin walking around in it. But don’t get me wrong, he never really started to stomp in it, or to splash his little sister who was nearby. He should be galavanting! Heck maybe he should even be dancing! I would at least hope he was smiling! Well, I guess some kids just aren’t like that. He was looking down and focusing on his feet under him. It was as if being a kid was too much of a waste of time for him and instead he was focused on the ways he’d be taking over the world once he could reach into the top cabinets of his kitchen without using a step stool. Mom stood nearby and watched him play. I actually took this picture because of the reflections in it. Since he looks like he’s reflecting on something (what could it be?) I thought it fitting that his shirt matched the colors reflected in the water where he was so intently focused.